Your All Blues monthly digest for March 2016! This newsletter is currently optimized for desktop viewing. Got a piece of All Blues history? Talk to us! We are currently looking for pictures, videos, and stories to feature on our social media channels, as well as to gear up for upcoming alum events. Send us your picture with a description of who's who and what's happening to the Media Team at allbluesmedia@googlegroups.com. Got a whole shoebox worth of pictures? Let us know, and we can do the dusting and scanning! The Berkeley All Blues are currently competing in their 15s spring developmental season. This means regardless of your experience level, now is the time for you and your friends to join! Players who have previously played will have the opportunity to enhance their knowledge and skill level. Those who are new to the game will be provided with the coaching necessary to achieve basic knowledge of the game and rugby skills. 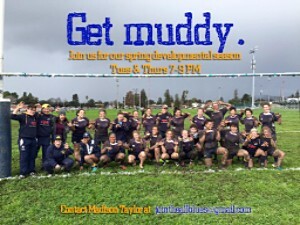 Interested in playing 7s? Come to our informational meeting onMay 17th, more details to follow. For information about joining the All Blues, please contact Madison, our recruiting coordinator, at jointheallblues@gmail.com. 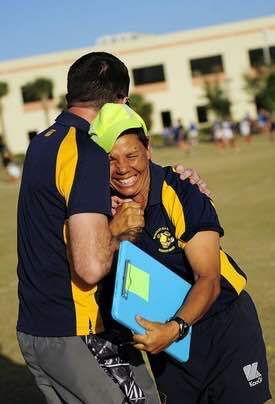 We are honored to announce that our former longtime coach and All Blues alum Kathy Flores is part of this year's US Rugby Hall of Fame Inductees! Included in her very impressive list of achievements was helping build the legacy of our club. From 1994-1997 she captained and coached the All Blues, winning two national titles while playing. As a coach she led the team to 15 National Championship titles. Please join us in congratulating her for her many years of service with our club as well her dedication to women's rugby in the US! To learn more, visit Kathy’s profile on the US Rugby HOF page. On March 19-20, the All Blues played in Champagne Classic, an annual social tournament held in San Marcos, CA. 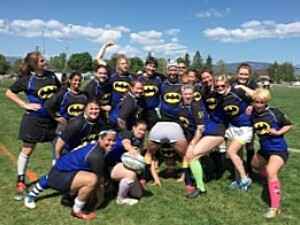 The All Blues competed in the women's club bracket, which included the hosting team San Diego Surfers, the “Pterrordactyls” (a touring team from Providence and NoVA), and Life West (another Bay Area team). The All Blues played four games on Saturday, and played one game on Sunday for the championship title against Life West. A highlight of the weekend included going against the Pterrordactyls and their "old lady tricks,” and learning how ineffective shirt grabs were to tackling players wearing skin-tight green leotards. Former All Blues and current USA Eagles Irene, Emily and Vix were also seen supporting on the sidelines! Overall a great weekend for learning together, and pinpointing areas we can work on as individuals and as a team. Missed the action from that weekend? Check out our twitter for a taste of Champagne Classic. Photos from our match vs. the Pterrordactyls are here, courtesy of Jay Coulter. When not hitting rucks, Allie enjoys looking for frogs in the rainforests of Panama. 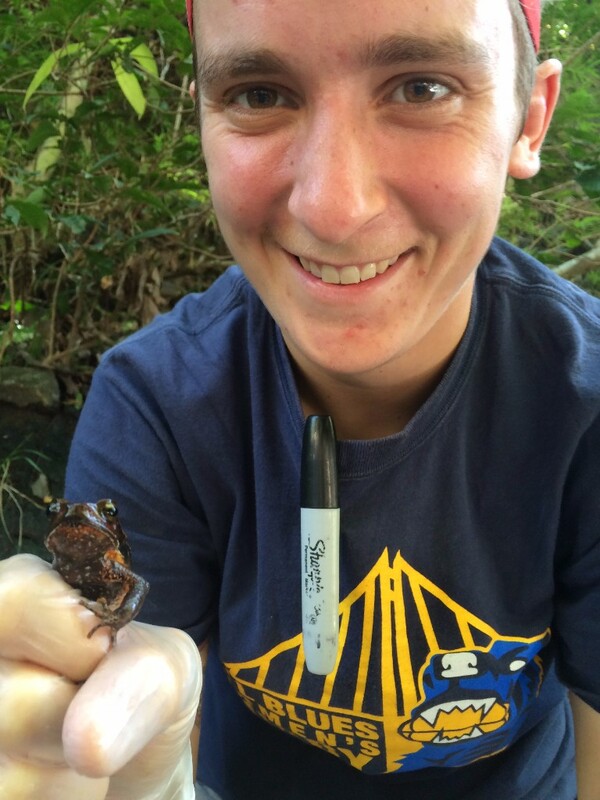 She is a self-professed nerd, currently working on her PhD at Cal on a disease that affects amphibians. Her spirit animal, however, is not a frog but a koala and a jaguar. She chose a koala because they are “mellow and cute,” but also a jaguar because they are “strong and reserved but you really don’t wanna mess because they will take you down.” Trust us, you definitely don't want to mess with her! Looking for a fun, social tournament? Join our team at the 40th annual Maggotfest in scenic Missoula, MT! This year’s tournament will be on May 7-8. For the last two years, the All Blues have received the distinction of “Most Honored Side” and it would be great to keep it going! For questions about flights and accommodations, ask Bridget at bridget.desantis@gmail.com (pssst...she’s been going for almost a decade!). We want to welcome baby Ben into the All Blues family! Benjamin Allen Kwan Boskovich was born on March 14, 2016 at 9 AM to proud parents Alex Boskovich and Jared Amgott-Kwan. Ben is currently training to be a rugger, like his parents before him. Word is that he's shaping up to be an 8-man. See you soon on the pitch, Ben. We'll have your BB 8 jersey ready!